To achieve 100% placement for students through dedication, attitude and complete involvement is our mission. 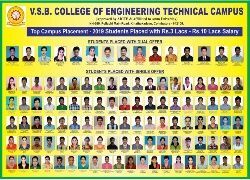 Training and Placement Cell arranges and coordinates various programmes that aim at moulding the students so as to meet the industry expectations in career building and in turn bring laurels to the parent institution. The Training and Placement Cell, guided by a set of rules and principles, strives to maintain good relationship with industries. Preparing the recruitment schedule for the year, inviting corporations for pre-placement talks on the campus followed by final placements, and overseeing the process to its end, is the responsibility of the Training and Placement Cell. The Cell endeavors to carry out successfully all the processes methodically throughout the year. Training department help the students to improve their employability skills in order to face the campus interview confidently and also to meet out the corporate expectations. We offer both internal and external kind of training for the student right from first year. Training department provides aptitude, communication, Soft skill, technical and programming training to the students as a value added programme.